1994 – Starting the Program for documentation and implementation of Quality System. Quality Assurance Department . Setting up the position of QUALITY Manager at the top management level. Issuing the first Quality Manual and first quality procedures. 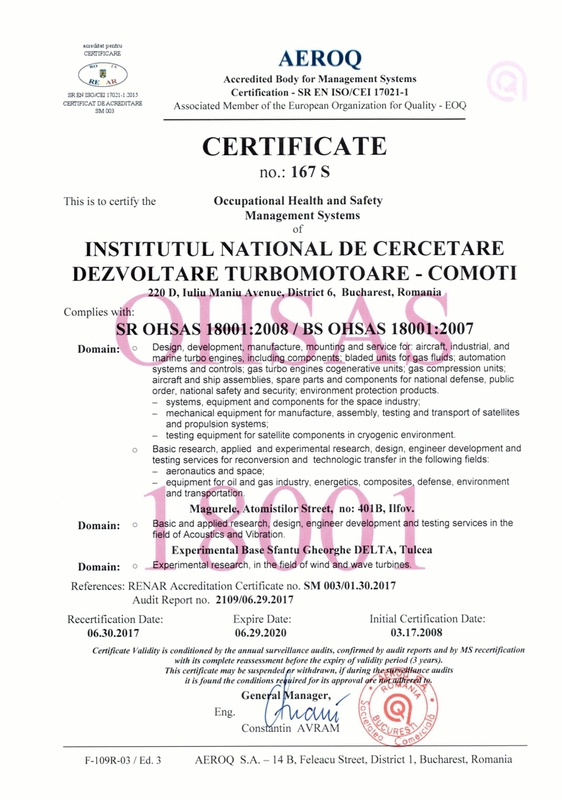 1995 – Starting the program for up-dating and adapting the Quality System to the requirements of International Standard SR EN ISO 9001:1995. This is applied in design/development, production, installation and servicing. 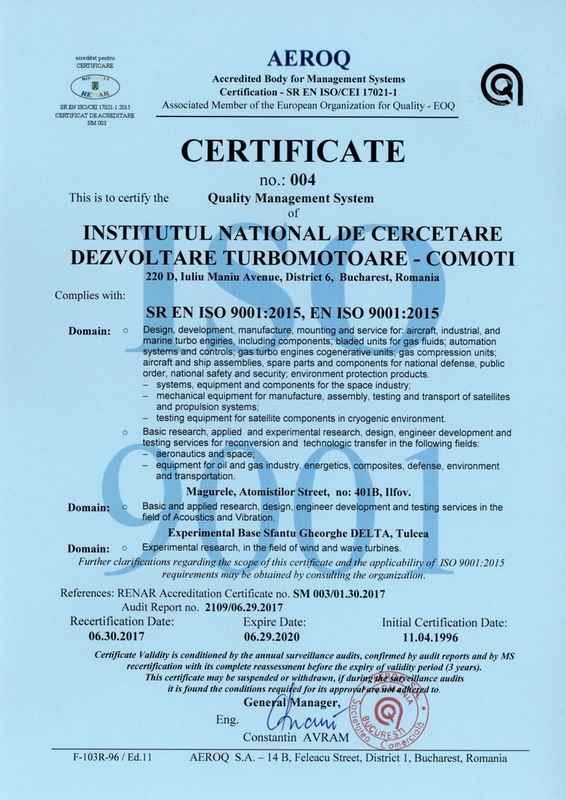 1996 – Quality System Certification according to the EN ISO 9001 Standard. 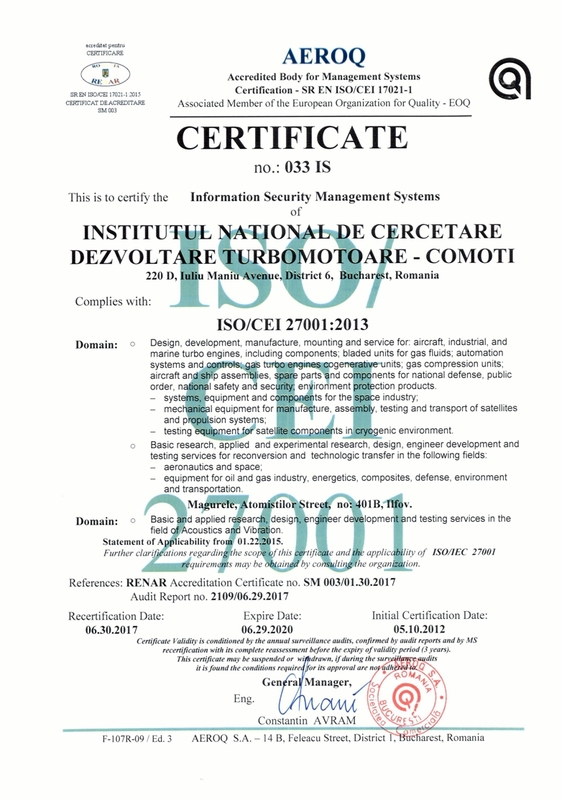 1997, 1999, 2002, 2004 – Ministry of Defense–Certification Body ( OMCAS ) certification according to the SR EN ISO 9001/2001/1995 standards and other processes according to the customer requirements- CERTIFICATE no. 33. 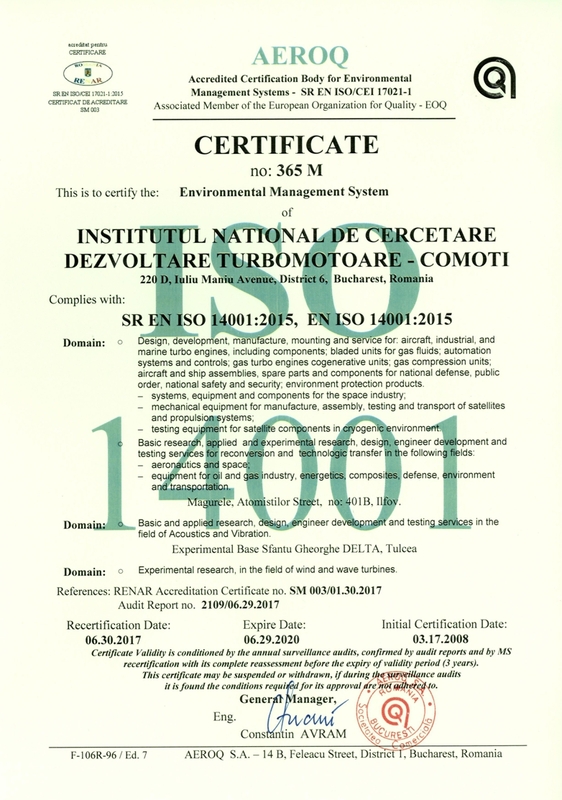 2008 - AEROQ Romania – Quality & Environmental & Occupational health and safety INTEGRATED MANAGEMENT SYSTEM Certification. Quality policy Declaration of the NATIONAL RESEARCH & DEVELOPMENT INSTITUTE FOR GAS TURBINES - COMOTI the quality is it the key for keeping a high competitiveness level among other suppliers. An Environmental & Occupational health and safety policy establishes an overall sense of direction and sets the principles of action for Institute too. Our Institute now being to prepare the compressor’s family certification process in accordance with PED requirements. We would like to précised: all our suppliers parts of compressors are CE marked. Is responsible to assure the delivery of conforming compressors, to respect the marking inclusive.